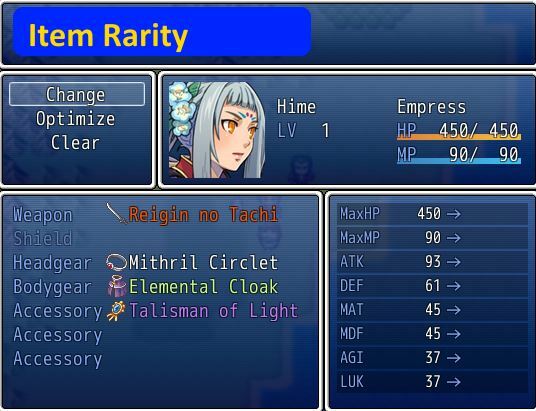 This script allows you to assign item rarities to items and equips. Rarity is indicated by name colour: by default, all names are white. You can customize this so that different rarity levels have different colours. level. The colours are specified in RGB format. Some sample entries have been provided for you. Is it possible to add multiple colors to one rarity? I would like to make a rainbow rarity. Mind the Question if u plan an update to JS for RPG Maker MV? This is going to sound really strange but this script seems to have an issue when used with your Feature Conditions script. If I specify feature conditions in the note tag box, the item rarity color will not appear on the item. Please disregard this issue, I forgot to put a line between the notetags. My apologies. Your code Isn&apos;t working look. They won&apos;t display I&apos;ve tried almost everything. In the script configuration, you would set up the rarity values and what color they correspond to. Then you would use that rarity value in your note-tag. And it will have whatever colour is assigned to rarity value 2. Ok i was really confused thanks! Would it be possible to give affixes rarities? There is an add-on for affixes that allows you to transfer the affix rarity to the item&apos;s rarity. Hi there, great script as usual! I am finding something rather peculiar with the script and I am not sure if it&apos;s just me. When I try to change my equipment, the <Remove Equip> seems to change to the color of the item color that is directly above it, as shown from the link below. 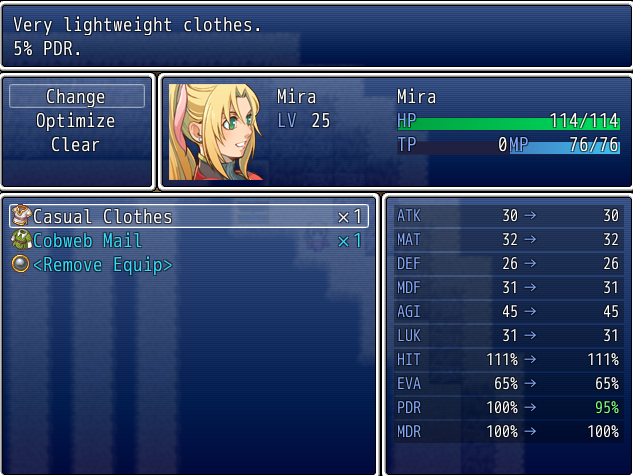 It is only a minor issue though, the script is wonderful for implementation of different item/equipment classes and categories. Thanks!